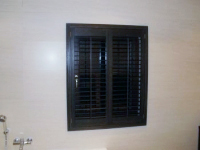 The safest method is the installation of shutters by qualified specialists. However, if you are technically qualified and assuming that took proper measurements you can do it individually. 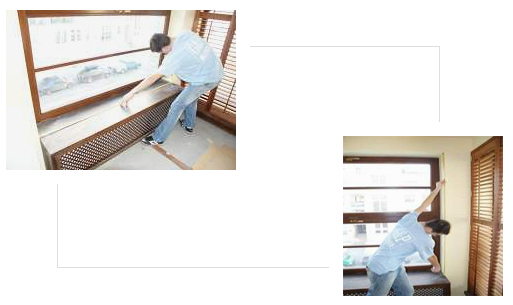 There is lots of methods of shutters assembly. You can install it from inside of an embrasure (window opening) on its edge or outside (on the wall). All methods are widely used, the space will suggest suitable method of assembly. Frames are used in the assembly. 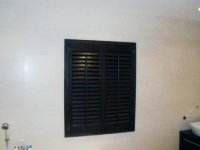 Variety of shapes cause that we can install shutters in almost every window notwithstanding the way of opening. Hinges are designed especially for our shutters and are in eight standard colors. Color of hinges can be adapted to shutter panels, use of the contrast for example sponge hinges are proper for silk white of shutter panel. 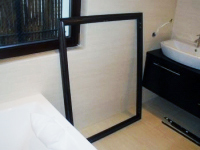 For moist rooms we recommend hinges made of stainless steel. The most important measurements are width and height. These measurements are taken inside of embrasure. You need to pay attention to maintaining levels and walls roughness. In such a case the smallest measurement must be considered. Shutters installation begins from frames assembly. 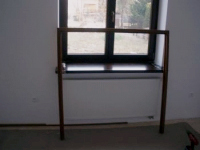 Frames are attached to walls with anchors. 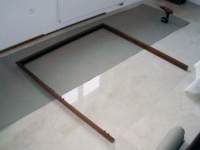 We install panels to assembled frame using hinges. 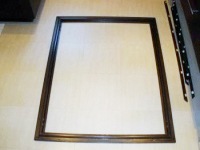 The next step is panel regulation in such a way that gaps between panels and a frame are alike.